The Fort Morgan City Hall. Camp Wardwell was established in 1865 along the Overland Trail to protect emigrants and supplies going to and from Denver and the mining districts. The fort was renamed in 1866 by General John Pope for one of his staff, Colonel Christopher A. Morgan, who had died earlier that year. The fort closed in 1868 after being used by 19 different companies from 11 cavalry and infantry regiments(~1,300 soldiers). The town of Fort Morgan was platted just south of the old military fort’s ruins on May 1, 1884 by Abner S. Baker, a member of Greeley's Union Colony. The town became the county seat of the newly formed Morgan County on February 19, 1889. As of the census of 2000, there were 11,034 people, 3,887 households, and 2,736 families residing in the city. The population density was 2,472.1 people per square mile (955.2/km²). There were 4,094 housing units at an average density of 917.2 per square mile (354.4/km²). The racial makeup of the city was 74.43% White, 0.28% African American, 1.01% Native American, 0.18% Asian, 0.24% Pacific Islander, 20.62% from other races, and 3.24% from two or more races. Hispanic or Latino of any race were 39.04% of the population. There were 3,887 households out of which 37.5% had children under the age of 18 living with them, 54.6% were married couples living together, 10.9% had a female householder with no husband present, and 29.6% were non-families. 25.6% of all households were made up of individuals and 12.6% had someone living alone who was 65 years of age or older. The average household size was 2.79 and the average family size was 3.32. In the city the population was spread out with 30.2% under the age of 18, 9.6% from 18 to 24, 29.1% from 25 to 44, 18.1% from 45 to 64, and 13.1% who were 65 years of age or older. The median age was 32 years. For every 100 females there were 100.4 males. For every 100 females age 18 and over, there were 97.6 males. The median income for a household in the city was $33,128, and the median income for a family was $36,134. Males had a median income of $27,667 versus $22,346 for females. The per capita income for the city was $15,024. About 8.9% of families and 12.9% of the population were below the poverty line, including 16.5% of those under age 18 and 8.6% of those age 65 or over. 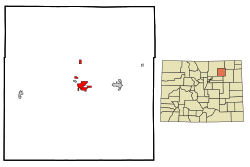 Fort Morgan, Colorado Facts for Kids. Kiddle Encyclopedia.